Service Advisor from the Microsoft Store at Pitt St Mall made a welcome return. Paul was with us just after the Microsoft Store opened and tonight, was the first of two presentations over the next two main meetings. 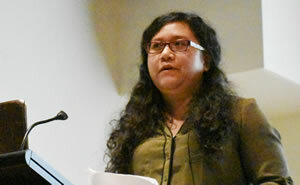 presented a short talk from her PHd study on the effect of music on dementia. She would like people over 50 to take part in a survey. If you would like to take the survey here is the link. 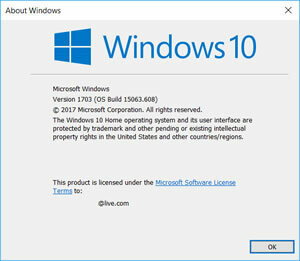 Paul was using a Surface Pro laptop running Windows 10 S and he started by dispelling some of the myths around Windows 10 S. In essence S is Windows 10 Pro with all the security benefits like Bitlocker and advanced security but with the restriction that only apps available on the Microsoft Store can be installed. So, while Chrome doesn’t appear to be available there are lots of third-party app available in the store that you can still install. You will even have iTunes available by the end of the year. One of the benefits of S is the ability to clean out the bloat that can build up over time. The speed of start-up in computers running S is maintained because those background processes that slow a computer down no longer need to run. Your Windows S will start-up just as quick next year as it did out of the box. 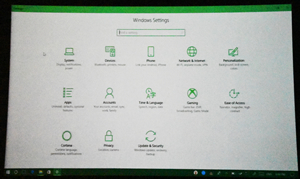 There was some discussion on the difference between the three versions of Windows Home, Pro and S. In essence Pro is designed for business users with networking needs. The main difference between Home and Pro for the home user is security. Pro has the security of bitlocker where you can encrypt your hard drive. To unlock it you need the 48-number key generated when bitlocker is first run. If you forget the code you can’t unlock the drive, however if you have signed on to the PC with your Microsoft account you can go to your OneDrive and retrieve the key. 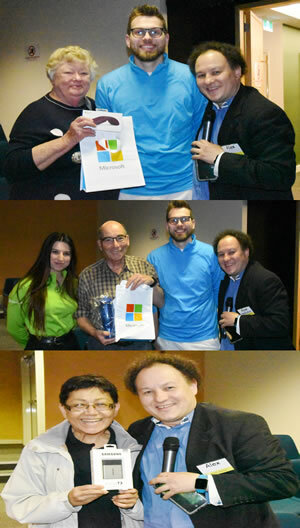 Paul noted that not all Microsoft users would want Windows S but would love a new Surface Pro from the Microsoft store. 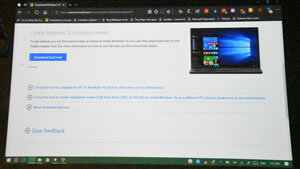 You may also want to run other non-Windows Store products so if you insist on running Chrome, Microsoft has made it easy to switch from S to Windows Pro on your Surface. If your Surface is running Windows 10 S, go to Windows 10 Pro in the Store and you should see a button to switch, for free to Pro. If you do switch you can’t then return to S. Paul was keen to note it was a switch not an upgrade as Windows S is a version of Pro. Windows is moving away from the version model to a more subscription model. Paul told us about Satya Nadella, Microsoft’s CEO announcement this week of Microsoft 365. Microsoft 365 is a business subscription service which combines the benefits of Office 365 with upgrade rights for Windows 10 and Enterprise Mobility and Security. The Mobility and Security handles security across the mobile devices such as company phones, laptops etc. 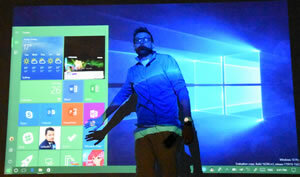 The 365 subscriptions will also include Windows S, aimed at the education market. We then moved on to have look at what we can expect with the Fall Creators Update. It’s due for release on October 17th and will roll out in waves as did the Creators update. 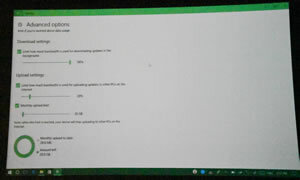 Paul started with some of the new user interface or UI changes, which change how Windows looks and feels. 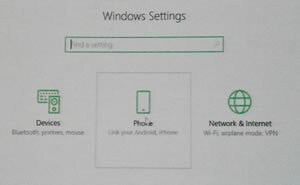 This time, unlike the introduction of Windows 8 these changes are friendlier. First of note was the changes to the start menu. You can now resize the menu by dragging the corner diagonally. It is also semi translucent. On the other side, the Action centre has had some changes. The clear all button and the collapse button have been combined in a drop-down button if there are notifications to clear. Currently the button sits on the top left-hand side of the notification centre. This change will put all the actions in one place. 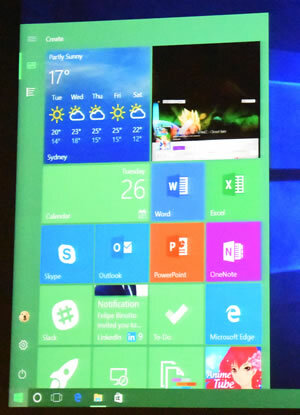 Going back to the start menu there are some new icons like show all apps. 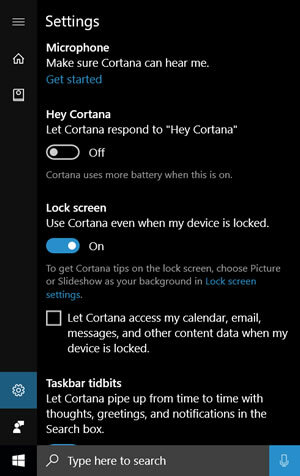 You can install Cortana on your Android devises and depending on your privacy settings Cortana can sync all your devices. 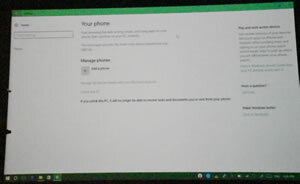 and under Phone you can add your phone to your Microsoft account. To work you send your phone a text message which has a link to your Microsoft account. You sign into your account from your phone and it is added to your list of connected devices. Paul suggested one use. You’re browsing on your phone and find a great site, with this app installed you can click on “continue on PC” and you get a list of all your Microsoft account devises, choose one eg desktop PC and when you get home it’s there for you to continue. and the falls edition has expanded on it. One of the first things Paul spoke to was system capacity when playing games. As a reference Paul used his Surface laptop. It’s only an I5 so not blazingly fast. He would like to run some games but the Windows still needs to run so his machine may have some speed issues. To overcome this problem Windows introduced Game Mode. It runs everything in the background to get that extra bust of performance. In the falls edition Game Mode now has a button on the game bar. Previously you needed to go into settings on the game bar to find it. Paul pointed out that game mode could be used for high demand programmes like Photoshop so the game bar is not just for gamers. Next, we looked at the broadcast tool. Microsoft purchased a company called Bean Pro which is a game streaming service. Using broadcast you can set up your microphone and your video and live stream your game through Xbox as you play it. Paul mentioned that it was not restricted to games. His example was a live steam showing the updates to the new Skype application. We then moved on to Update and security. No, you can’t turn off windows update! however there are lots of things you can do to control it. Paul started with Metered connections. Go into setting and find network & internet, then go to Wi-Fi and click on “manage known networks”. In “Manage known networks” you can tell Windows which Wi-Fi networks are metered. This stops Windows using that connection to download updates. Currently, showing an ethernet connection as metered is not possible. The problem for some people was that they only had limited downloads even at home. 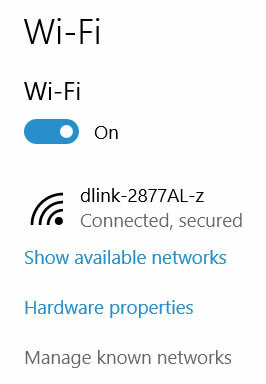 Microsoft has addressed that in the falls edition where you can set your home connection as a metered connection. 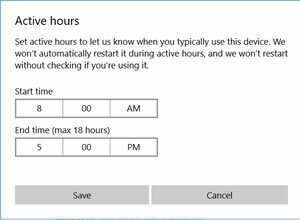 On questions from the group Paul mentioned that you can limited the times your machine will install updates by setting the Active Hours. Your machine will not schedule a restart during those hours. With the falls edition there are more controls coming under advanced options. First up was Delivery optimisation which allows you to change the way you receive new updates. 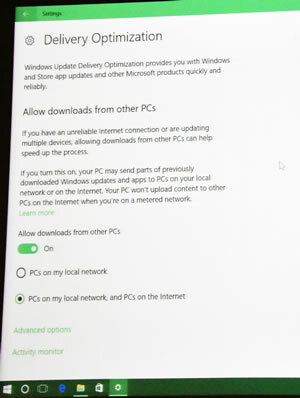 This is an update of the advanced options under settings which allow the downloaded updates to be distributed around the other PCs on your network. One thing Paul spoke about was the PC on the internet setting. What this means is that your PC becomes a peer to peer network and downloads should be faster as you don’t rely solely on the Microsoft server to download updates. One eagle eyed member noted that under disk optimisation was another advanced options button, that lead to this activity monitor. This will show your download and upload activity for your PC. Paul told us that with this monitor we can determine the bandwidth we allow windows updates to use so there is not interference with that movie we want to stream. You can also limit the amount of data you allow your PC to upload, very useful if you have upload limits on data. You can even turn off data upload. 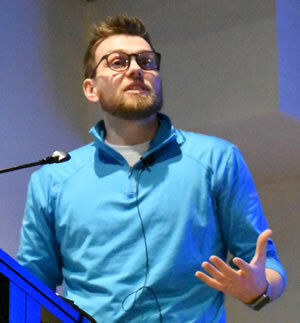 After the break, Paul returned to the stage and following questions about upgrades and licences introduced us to the Windows Media Creation Tool. He spoke about how to stop the “out of box” experience where your new PC needs to download a year or mores worth of updates. Using this tool you will get the latest version of windows 10. You shouldn’t need you produce key as the instillation will recognise that you had windows 10 on your machine. Or if it’s a new PC with Windows 10 installed it should go straight to installation without a problem. here’s the result. The version number 1703 indicates its release date is the 3rd month of 2017. We moved on to the new features of OneDrive. You get 5GB of storage with your Microsoft account, or 1TB if you have Office 360, and if you have 360 home you have 4 devices and they each get 1TB. Up to now if you synced your OneDrive with your PC all the data was held both in OneDrive and your computer. With the falls edition you can tailor how you sync the drives. Paul demonstrated using his film and TV directory. On his OneDrive it had it takes 650 GB, on his PC it takes 4.27GB. This is because he has only downloaded the films he wants. The rest remains in OneDrive. 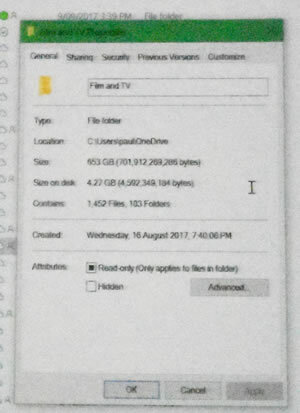 Unlike the current version Paul can see the file available on his OneDrive but they take no space, not even a place holder. OneDrive files on demand allows you to decide what files you wish to keep on your PC and arrange file on your OneDrive as if they were resident on your PC, so no need to go to the OneDrive Web interface. 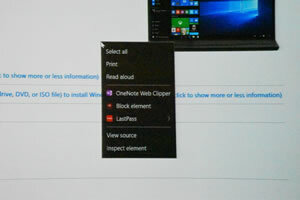 Last up we had a look at Edge and its new updates. The falls edition of Edge should be even better on battery consumption and has an enhanced e-pub reader. E-pub is short for electronic publication like a PDF on steroids. With the falls edition Edge will have the ability to change fonts and text size paragraph spacing, even backgrounds. 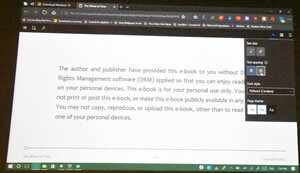 Microsoft already has narrator but with the Edge fall edition you can have narrator read your e-pub aloud. The function will be available to all web sites you visit with a new “read aloud” tag. along with this Microsoft developers blog. To finish Paul showed us the new keyboard. It looks the same but now has swipe functionality. Those with mobile phones and android tablets may be familiar with the swipe function. It allows rapid typing by running your fingers over the keyboard. 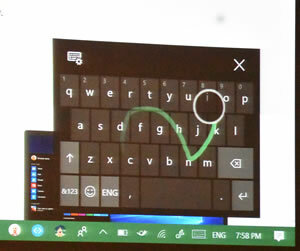 You can even use the eye tracking to swipe the keyboard. The falls creator’s edition will be released in Australia on the 17th October. 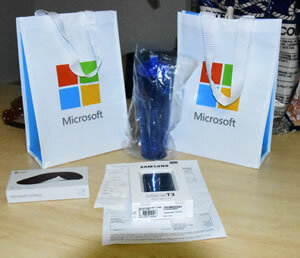 Tonight, Paul organised with the Microsoft Store, a great Wireless Surface mouse and tot bag. We also had a Samsung T3 500GB SSD drive. Sydney PC User Group Inc. © 2008 Last updated: Thu. 16 Nov. 2017.